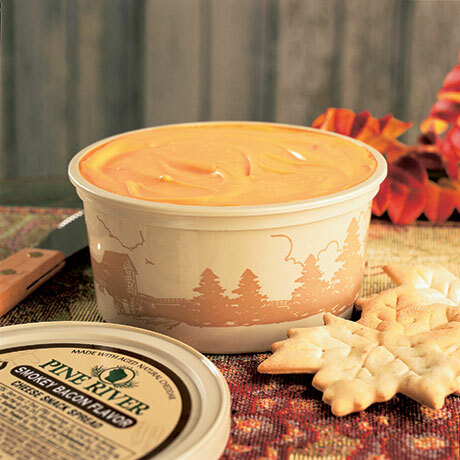 This hearty Cheddar cheese spread has a delicious, hickory-smoked bacon flavor! 12-ounce cup. SHARP CHEDDAR CHEESE (MADE FROM PASTEURIZED CULTURED MILK, SALT, AND ENZYMES), WATER, REDUCED LACTOSE WHEY, MALTODEXTRIN, CREAM, WHEY PROTEIN CONCENTRATE, SKIM MILK, MODIFIED CORN STARCH, IMITATION BACON BITS (TEXTURED SOY FLOUR, PARTIALLY HYDROGENATED SOYBEAN OIL, SALT, NATURAL AND ARTIFICIAL FLAVOR, DEXTROSE, RED #3, RED #40), SORBIC ACID (A PRESERVATIVE), GUAR GUM, LACTIC ACID, DISODIUM PHOSPHATE, ANNATTO COLOR, SMOKE FLAVOR.